These pickles are not safe. Please do not eat the bubbling dill pickles with white film in the jar. These pickles are spoiled and only a microbial analysis can tell what is spoiling them and whether it is harmful. Growth of either bacteria or yeast can produce gas. Growth of bacteria, yeasts and/or molds can cause the film. Molds growing in pickles can use the acid as food thereby raising the pH. A raised pH increases the chance that harmful organisms (such as the organism that causes botulism) can grow. The proportion of vinegar to water in this pickling brine is 1 to 4 and is too low to be safe. A safe, tested quick dill pickle recipe is included below; the ratio of vinegar to water in this recipe is 3 to 4. Cucumbers contain very limited acidity and typically have a pH of 5.12 to 5.78. Making sure enough vinegar is added to the cucumbers is important to make safe pickles; Clostridium botulinum can grow in improperly canned, pickled foods with a pH higher than 4.6. 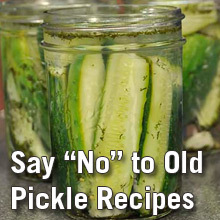 It is critical to use scientifically tested recipes for making pickles to ensure their safety. Wash cucumbers. Cut 1/16-inch slices off blossom ends and discard, but leave ¼ inch of stem attached. Dissolve ¾ cup salt in 2 gallons water. Pour over cucumbers and let stand 12 hours. Drain. Combine 1½ quarts vinegar, ½ cup salt, ¼ cup sugar and 2 quarts water. Add mixed pickling spices tied in a clean, white cloth. Heat to boiling. Fill jars with cucumbers. Add 1 teaspoon mustard seed and 1½ heads fresh dill (or 1½ teaspoons dill seed) per pint jar. Cover with boiling pickling solution, leaving ½-inch headspace. Remove air bubbles. Wipe jar rims. Adjust lids and process pints for 10 minutes or quarts for 15 minutes in a boiling water bath. My recommendation is to dispose of the spoiled pickles where your pets (if any) cannot get to them (See HGIC 3000 Preserving Foods for recommendations for safe disposal of spoiled canned foods). See the following links for tested information about making cucumber pickles from our Home and Garden Information Center.